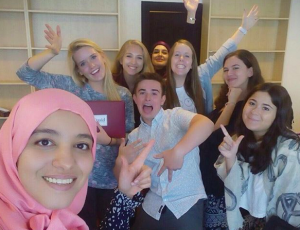 Kate is from Norfolk, VA and participated in the Jordan Summer 2017 program. 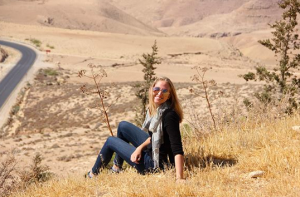 Looking back, the application process for NSLI-Y went by in a flash; before I knew it, I was being rocked by the turbulence of a plane descending over the deserts of the Middle East. I remember my first few days in Jordan vividly. From the moment I stepped off the plane with my cohort of scholarship recipients (with whom some of my best memories have been made), I was drawn to the unfamiliar world around me with a sense of simultaneous wonderment and confusion. We were picked up from the airport (in the bus that would later take us to and from school every day), and were taken to the dorm-style accommodations that would house us until we were to meet our host families. The first few days were packed full of ice breakers, scavenger hunts around Amman, and lots of independent study time, until finally, after much anticipation, our host families came, one-by-one to pick us up and show us where we would be staying for the duration of our study abroad experience. My roommate, Lily, and I were placed with a family of three (our host parents Raed and Noor and their two year old daughter, Mimi) who spoke English well enough to understand our many questions before we gained the ability to ask them in Arabic, and who helped us to feel at home in their family. We also had a host grandmother who lived nearby with two other students from our program, so we were all able to experience plenty of family get-togethers and outings with our friends.Our whole group studied at Qasid Arabic Institute where we learned vocabulary, grammar, and culture with amazingly devoted teachers (who stayed in good spirits even through all the dance parties, serenades, and mild breakdowns about the coffee machine being out of water). Every day, we had four hours of class, and most days, we also had a chance to grab lunch (my favorite was falafel) and go to the store for some snacks (which pretty much always meant chocolate). The culture surrounding food in Jordan is much different than in the states. Of course the flavors and the meal times are understandably different, but I think what was most unexpectedly dissimilar about the food was the gigantic portion sizes (we joked that instead of the freshmen 15 we were faced with the NSLI-Y 500). Still, despite the minor difficulties at meal times, some of my favorite foods were introduced to me during my time in Jordan (diwali, shawarma, and, of course, our nightly booza were a few of my absolute favorites). While there are so many parts of my trip that could qualify as my favorite, if I were to choose just one aspect to fawn over, I would have to choose our group trips. Though some cities and areas in Jordan were off-limits to U.S. citizens due to security threats during the time of our trip, we were able to visit the Dead Sea, Madaba, Mount Nebo, Petra, and many other beautiful places within Jordan before the summer ended. 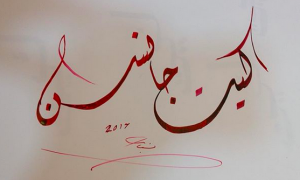 When I think back over the immense wealth of knowledge ( Arabic and otherwise) that I gained in Jordan, I often wonder how I managed to accomplish so much in such a short amount of time, but when I consider how lengthy and jam-packed each day was, it becomes a little clearer. In fact, just the other day, I came across a note on my phone that listed our schedule for our last week, and I was still surprised at the heft of our plans; our trip to Petra, a language exchange, our presentations and exams, a group meeting, daily classes, our graduation ceremony, and celebrations all took place in quick succession over the last few days. 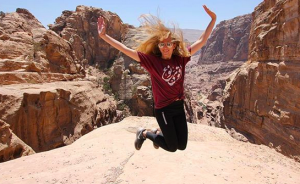 My last days in Jordan were a whirlwind of emotions. In a span of 24 hours, I went from upset that it was my last day with my host family, to contented in class, to proud of my graduation from Qasid, to full of class-spirit at our post-graduation competition, to appeciative of my teachers and host family for devoting themselves to my education, to heartbroken that I was leaving it all behind. There will always be a special place in my heart for the people I met and my experiences during my time as a NSLI-Y student, and I am eternally grateful for the way these experiences exposed me to new opportunities and new ways of thinking. By allowing me to step out of my comfort zone in a safe environment, and encouraging me to choose my own path, NSLI-Y has helped me to create a brighter future for myself.